One of the most popular local flea markets is coming to White Marsh later this month. 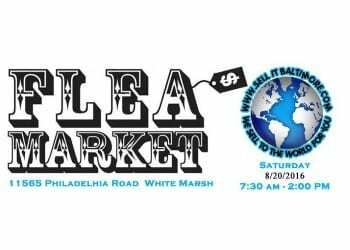 The “Sell It Baltimore” flea market will be held on Saturday, August 20, from 7:30 a.m. to 2 p.m. The event will feature antiques, collectibles, household items, tools, comic books, baseball cards, coins, jewelry, gold, silver, toys, bank foreclosures, estates, and more. To learn more, visit the Facebook event page here or visit the official Sell It Baltimore website here.